Use Internet Explorer to collect data on computers running Windows Internet Explorer 8 through Internet Explorer 11 on Windows 10, Windows 8.1, or Windows 7. This inventory information helps you build a list of websites used by your company so you can make more informed decisions about your IE deployments, including figuring out which sites might be at risk or require overhauls during future upgrades. You can use Upgrade Readiness to help manage your Windows 10 upgrades on devices running Windows 8.1 and Windows 7 (SP1). You can also use Upgrade Readiness to review several site discovery reports. For more information, see Manage Windows upgrades with Upgrade Readiness. Go to the Microsoft Security Bulletin page, and change the filter to Windows Internet Explorer 11. 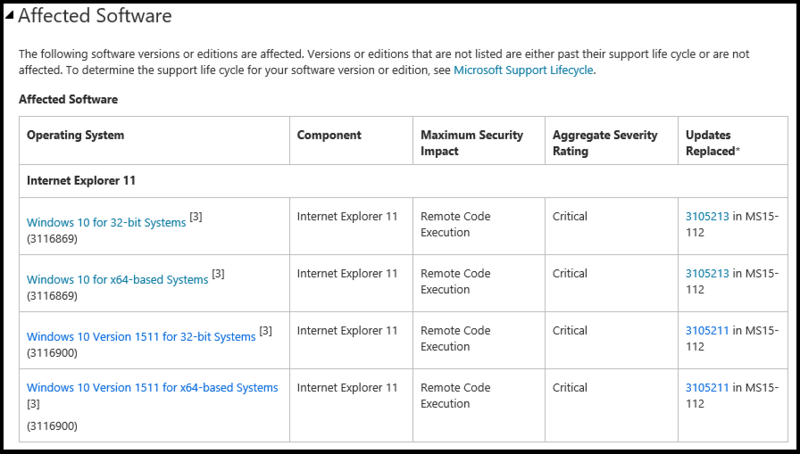 Click the title of the latest cumulative security update, and then scroll down to the Affected software table. Click the link that represents both your operating system version and Internet Explorer 11, and then follow the instructions in the How to get this update section. You must use System Center 2012 R2 Configuration Manager or later for these samples to work. Both the PowerShell script and the Managed Object Format (.MOF) file need to be copied to the same location on the client device, before you run the scripts. Data is collected on the configuration characteristics of IE and the sites it browses, as shown here. ActiveX GUID X X X X GUID of the ActiveX controls loaded by the site. Document mode X X X X Document mode used by IE for a site, based on page characteristics. Document mode reason X X The reason why a document mode was set by IE. Number of visits X X X X Number of times a site has been visited. Zone X X X X Zone used by IE to browse sites, based on browser settings. By default, IE doesn’t collect this data; you have to turn this feature on if you want to use it. After you turn on this feature, data is collected on all sites visited by IE, except during InPrivate sessions. Additionally, the data collection process is silent, so there’s no notification to the employee. Therefore, you must get consent from the employee before you start collecting info. You must also make sure that using this feature complies with all applicable local laws and regulatory requirements. The following tables provide more info about the Document mode reason, Browser state reason, and the Zone codes that are returned as part of your data collection. The codes in this table can tell you what document mode was set by IE for a webpage. These codes only apply to Internet Explorer 10 and Internet Explorer 11. 3 Page state is set by the FEATURE_DOCUMENT_COMPATIBLE_MODE feature control key. 4 Page is using an X-UA-compatible meta tag. 5 Page is using an X-UA-compatible HTTP header. 6 Page appears on an active Compatibility View list. 7 Page is using native XML parsing. 8 Page is using a special Quirks Mode Emulation (QME) mode that uses the modern layout engine, but the quirks behavior of Internet Explorer 5. 9 Page state is set by the browser mode and the page's DOCTYPE. The codes in this table can tell you why the browser is in its current state. Also called “browser mode”. 1 Site is on the intranet, with the Display intranet sites in Compatibility View box checked. 2 Site appears on an active Compatibility View list, created in Group Policy. 3 Site appears on an active Compatibility View list, created by the user. 4 Page is using an X-UA-compatible tag. 5 Page state is set by the Developer toolbar. 6 Page state is set by the FEATURE_BROWSER_EMULATION feature control key. 7 Site appears on the Microsoft Compatibility View (CV) list. 8 Site appears on the Quirks list, created in Group Policy. 11 Site is using the default browser. The codes in this table can tell you what zone is being used by IE to browse sites, based on browser settings. These codes apply to Internet Explorer 8, Internet Explorer 9, Internet Explorer 10, and Internet Explorer 11. -1 Internet Explorer is using an invalid zone. 0 Internet Explorer is using the Local machine zone. 1 Internet Explorer is using the Local intranet zone. 2 Internet Explorer is using the Trusted sites zone. 3 Internet Explorer is using the Internet zone. 4 Internet Explorer is using the Restricted sites zone. WMI file. Use Microsoft Configuration Manager or any agent that can read the contents of a WMI class on your computer. XML file. Any agent that works with XML can be used. We recommend that you collect your data for at most a month at a time, to capture a user’s typical workflow. We don’t recommend collecting data longer than that because the data is stored in a WMI provider and can fill up your computer’s hard drive. You may also want to collect data only for pilot users or a representative sample of people, instead of turning this feature on for everyone in your company. The data collection process is silent, so there’s no notification to the employee. Therefore, you must get consent from the employee before you start collecting info. You must also make sure that using this feature complies with all applicable local laws and regulatory requirements. Collect your hardware inventory using the MOF Editor, while connecting to a client device. Collect your hardware inventory using the MOF Editor with a .MOF import file. You need to set up your computers for data collection by running the provided PowerShell script (IETelemetrySetUp.ps1) to compile the .mof file and to update security privileges for the new WMI classes. You must run this script if you’re using WMI as your data output. It's not necessary if you're using XML as your data output. Start PowerShell in elevated mode (using admin privileges) and run IETElemetrySetUp.ps1 by by-passing the PowerShell execution policy, using this command: powershell -ExecutionPolicy Bypass .\IETElemetrySetUp.ps1. For more info, see about Execution Policies. In Control Panel, click System and Security, and then click Windows Firewall. In the left pane, click Allow an app or feature through Windows Firewall and scroll down to check the box for Windows Management Instrumentation (WMI). You can determine which zones or domains are used for data collection, using PowerShell. If you don’t want to use PowerShell, you can do this using Group Policy. For more info, see Use Group Policy to finish setting up Enterprise Site Discovery. The .ps1 file updates turn on Enterprise Site Discovery and WMI collection for all users on a device. Domain allow list. If you have a domain allow list, a comma-separated list of domains that should have this feature turned on, you should use this process. Zone allow list. If you have a zone allow list, a comma-separated list of zones that should have this feature turned on, you should use this process. Start PowerShell in elevated mode (using admin privileges) and run IETElemetrySetUp.ps1, using this command: .\IETElemetrySetUp.ps1 [other args] -SiteAllowList sharepoint.com,outlook.com,onedrive.com. Wildcards, like *.microsoft.com, aren’t supported. Start PowerShell in elevated mode (using admin privileges) and run IETElemetrySetUp.ps1, using this command: .\IETElemetrySetUp.ps1 [other args] -ZoneAllowList Computer,Intranet,TrustedSites,Internet,RestrictedSites. Only Computer, Intranet, TrustedSites, Internet, and RestrictedSites are supported. You can use Group Policy to finish setting up Enterprise Site Discovery. If you don’t want to use Group Policy, you can do this using PowerShell. For more info, see Use Powershell to finish setting up Enterprise Site Discovery. 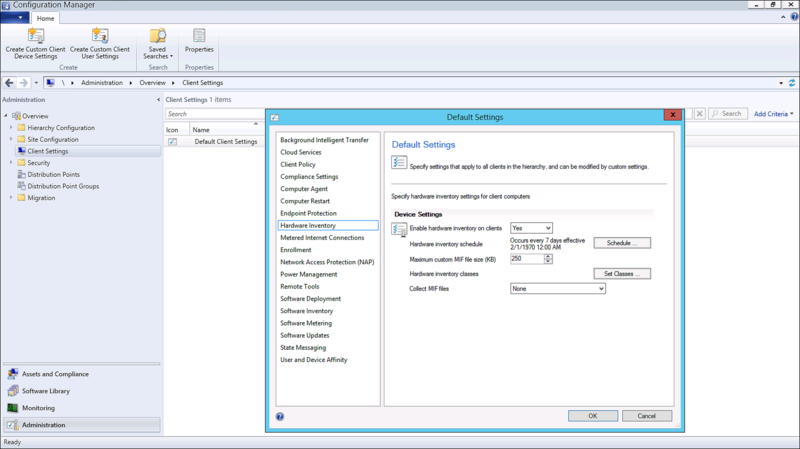 All of the Group Policy settings can be used individually or as a group. Administrative Templates\Windows Components\Internet Explorer\Turn on Site Discovery WMI output Writes collected data to a WMI class, which can be aggregated using a client-management solution like Configuration Manager. On. Turns on WMI recording. Off. Turns off WMI recording. Administrative Templates\Windows Components\Internet Explorer\Turn on Site Discovery XML output Writes collected data to an XML file, which is stored in your specified location. XML file path. Including this turns on XML recording. Blank. Turns off XML recording. You can collect your hardware inventory using the MOF Editor, while you’re connected to your client devices. From the Configuration Manager, click Administration, click Client Settings, double-click Default Client Settings, click Hardware Inventory, and then click Set Classes. Click Add, click Connect, and connect to a computer that has completed the setup process and has already existing classes. 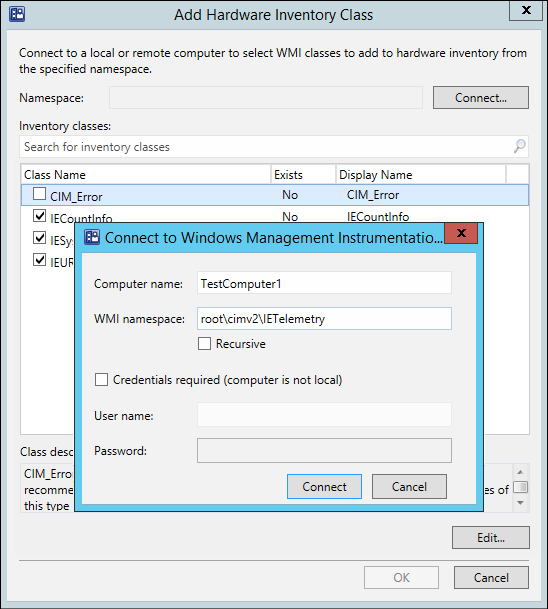 Change the WMI Namespace to root\cimv2\IETelemetry, and click Connect. Click OK to close the default windows. You can collect your hardware inventory using the MOF Editor and a .MOF import file. Click Import, choose the MOF file from the downloaded package we provided, and click Open. Pick the inventory items to install, and then click Import. You can collect your hardware inventory using the using the Systems Management Server (SMS\DEF.MOF) file. Editing this file lets you collect your data for System Center Configuration Manager 2007. If you aren’t using this version of Configuration Manager, you won’t want to use this option. Using a text editor like Notepad, open the SMS\DEF.MOF file, located in your <configmanager_install_location>\inboxes\clifiles.src\hinv directory. Save the file and close it to the same location. Your environment is now ready to collect your hardware inventory and review the sample reports. 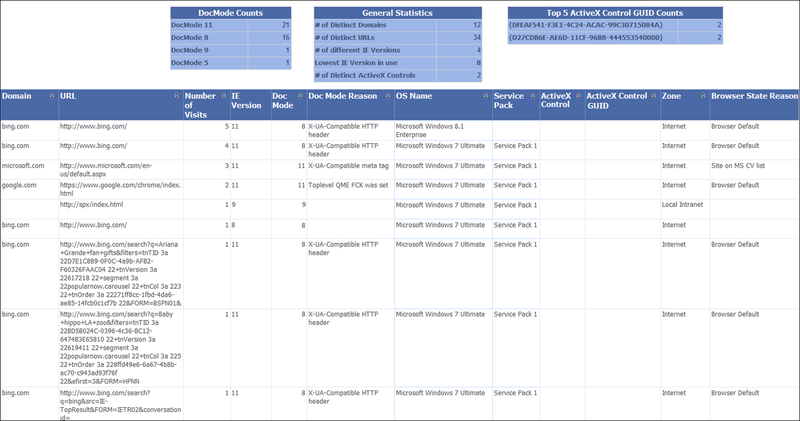 The sample reports, SCCM Report Sample – ActiveX.rdl and SCCM Report Sample – Site Discovery.rdl, work with System Center 2012, so you can review your collected data. You can import this XML data into the correct version of the Enterprise Mode Site List Manager, automatically adding the included sites to your Enterprise Mode site list. 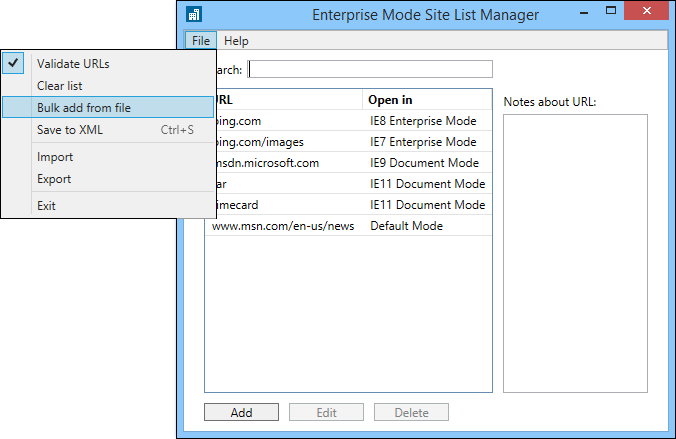 Open the Enterprise Mode Site List Manager, click File, and then click Bulk add from file. Go to your XML file to add the included sites to the tool, and then click Open. Each site is validated and if successful, added to the global site list when you click OK to close the menu. If a site doesn’t pass validation, you can try to fix the issues or pick the site and click Add to list to ignore the validation problem. For more information about fixing validation problems, see Fix validation problems using the Enterprise Mode Site List Manager. Click OK to close the Bulk add sites to the list menu. After you’ve collected your data, you’ll need to turn Enterprise Site Discovery off. On your client computer, start Windows PowerShell in elevated mode (using admin privileges) and run IETelemetrySetUp.ps1, using this command: powershell -ExecutionPolicy Bypass .\IETElemetrySetUp.ps1 –IEFeatureOff. Turning off data collection only disables the Enterprise Site Discovery feature – all data already written to WMI stays on your employee’s computer. Open your Group Policy editor, go to Administrative Templates\Windows Components\Internet Explorer\Turn on Site Discovery WMI output, and click Off. Go to Administrative Templates\Windows Components\Internet Explorer\Turn on Site Discovery XML output, and clear the file path location. You can completely remove the data stored on your employee’s computers.